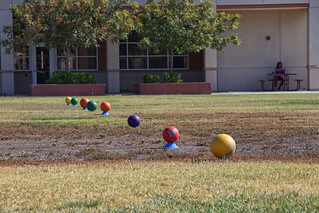 On October 24th of 2018, West Hills College Lemoore held its first ever annual dodgeball tournament in front of the student union. At this event, all students were given the opportunity to choose a team and play various games of dodgeball to see which team would be crowned the winners. Students of all backgrounds were welcomed, and some clubs even brought their members out as teams to join the match. The event was a great way of having the West Hills community come out and engage in activities with one another. Be on the lookout for future events so that you too can join in on the fun!